The unusual round shape of this Coloriffics evening purse makes it worth a second glance. It really stands out in a sea of baguette and box clutches. The round shape accentuates the soft, satiny pleats, while the traditional kiss-lock closure gives it an old Hollywood feel. The complementary satin strap makes a welcome change from those uncomfortable chains we're used to seeing too. What I love most though is that this purse is practical as well as pretty. The base of this round bag is flattened, so it won't topple over once you set it down. It's stylishly narrow, but the long, wide dimensions help it handle your evening essentials. You might even be able to squeeze in a few luxuries if you know how to pack carefully. Coloriffics fans may be disappointed that, unlike many handbags in the label's range, this one can't be dyed. What you see is what you get here, so I hope you like black, brown, or ivory! 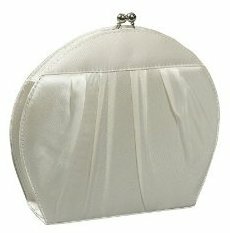 While we may not have a lot of choice, at least this evening bag is affordable. At just $38, I don't mind compromising on the colors. The Coloriffics pleated bag, a great alternative to this round bag.